Barrister (Mrs.) Anna Mbasughun Darius Ishaku, wife of the Taraba State Governor was born on the 24th of August, 1957. She hails from Vandeikya Local Government Area of Benue State and is married with 5 children. Barr. Anna Ishaku began her educational pursuit at St. Bartholomew’s Primary School, Wusasa, Zaria from 1964-1969; where she proceeded to Girls High School Gindiri between 1969-1973. She thereafter enrolled into the School of Basic Studies, ABU-Zaria between 1975-1976 and into the Faculty of Law of the same institution in 1976 where she graduated with Law Degree in 1979. She further attended Nigerian Law School, Lagos in 1979 and was called to the Nigerian Bar in 1980. She started her career in the National Youth Service as Legal Aid Council in Kano after which she joined the Private firm of Sam Tsumba and Company in Makurdi, where she was engaged in private practice until 1985 when she left to join her husband in Kaduna. 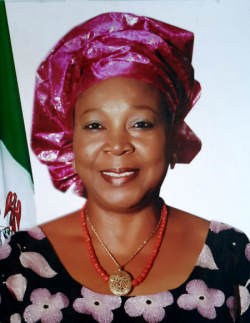 She was employed in the Ministry of Justice Kaduna State, as a Senior State Counsel in 1986 and rose to the ranks of Assistant Director, then Acting Director Public Prosecutions where she was appointed the Solicitor-General and Permanent Secretary of the Ministry in 1997, a position she held until 2002 when she left to join the ECOWAS Community Court of Justice as Chief Registrar. Barr. Anna Ishaku was one time Chairperson and is also a life member of the International Federation of Women Lawyers, (FIDA). She was one time Treasurer, Nigerian Bar Association (NBA) Kaduna Branch. She was a Member, African Network for the Prevention of Child Abuse and Neglect, (ANPCAN), Kaduna Branch and Legal Adviser to the Association of the Physically Challenged, Kaduna Branch. Chancellor – Anglican Diocese of Katsina, 1994 – Date. Deputy Chancellor – Anglican Diocese of Kaduna. Legal Adviser – Our Saviour’s Anglican School. New Constitution and Transition to Civil Rule 1989. Crime and Crimes Control- 1990. Use of Computer Print – Out Evidence 1992. Challenges of legal practice in the 21st Century Nigeria. Training on Preparation of Budget. Training in Advocacy, Mobilization, and Counselling Skills 1998.
International Visitors Program on US Judicial System 2001. Hubert Humphrey Fellowship Program, US sponsored Mediation and Leadership Training in Minnesota University, USA. She enjoys Gardening and Listening to Music. The Hope Afresh Foundation Taraba is a Non-Governmental Organization of the wife of the Executive Governor of Taraba State, Barr. Anna Darius Ishaku started on 7th July 2016 with the mission of rendering lasting and quality empowerment that will restore the hope of Tarabans. Its vision is to become a global key player in providing humanitarian services, while its core value is to rekindle the hope of Tarabans through meaningful and life-sustaining programs. The Foundation has five units through which it carries out its operations. The sections include Administration, Project, Protocol, Press and the ICT. The Administrative Unit: An administrative officer heads who manages and executes administrative and executive support activities associated with the organization. The administrative officer reports directly to the Chief Executive Officer of the NGO, (Her Excellency) and serves as principal point of administrative contact and liaison with staff and outside individuals and institutions. She oversees the provision of direct staff support to the project. Provides specialist administrative services as appropriate in such areas as public/community relations; legal issues; general business administration. Responsible for the general day-to-day management of the organization. Assisting the Chief Executive and supporting the staff team. Performs miscellaneous job-related duties as assigned by Her Excellency. The Project unit: The unit is headed by a manager who manages the overall projects that meet its goals and objectives. The Project Manager ensures that lined-up programs are carried out within the specified period. She guides the preparation of work or action plan for the lifespan of the project. She controls the coming in and going out of any official transactions and keeps records of activities and achievements as well as initiate actions that will enhance the growth of the project. Other functions of the Project Manager include periodic reports of the project specifying success areas, challenges, and recommendation. She must be in a good picture of any expenses as regards capital, recurrent and overhead and be among the signatories of the project’s account. The Protocol Unit: A chief protocol officer heads this section. In achieving excellence in the office, the protocol officer needs the services of other officers to assist her. She knows details of the organization must be ready to share valuable information with people who need to know and to the Chief Executive of the Organization (Her Excellency). She must also relate closely to the other close aides of Her Excellency, i.e. the Administration Unit, Press Unit, Project Unit, ICT unit as well as liaison offices and conference visitors. The Protocol Unit is the vital link between the Chief Executive (Her Excellency) and the public. Preparation of day to day programs of Her Excellency at both local and out-of-state engagements. Reception arrangements including transportation and preparing accommodation or other facilities before the incoming visitors. Procurements of tickets for Her Excellency, and her Principal Officers and any other guest that may accompany her on that trip. Convoy arrangements during Her Excellency’s movement. Arranging state banquets, cocktails in order of precedence, and other receptions for Her Excellency and outside or state dignitaries. Liaison with the other service e.g. Police, State Security Service, and the Press for proper co-ordination. Delivery of special messages from Her Excellency to dignitaries within the state and out of state. The Protocol Unit is responsible for the purchase of various gift items for the official use of Her Excellency.The Protocol Officer makes printing of invitation cards and programs of different occasions and sitting plans. The Protocol Officer is the prompter and time-keeper to Her Excellency. She collects the list of visitors for the next day and sends to security at the gate, and place a copy on Her Excellency’s table every morning before she arrives. It reminds her of the visitors she is expecting for the day. Finally, the Protocol Officer carries out any other duties assigned by her principal (Her Excellency). The Press Unit: The Chief Press Secretary, acts as the organization’s senior spokesperson, especially as regards the Chief Executive (Her Excellency). The Press Secretary provides advice on how to deal with the news media and using news management techniques to help the Chief Executive to maintain a positive public image and avoid negative media coverage. She writes press releases and gives declarations to media when a particular event happens, or an issue arises inside the organization. The Press Secretary has a tremendous knowledge of the organization. This experience enables her to explain or answer questions about the organization’s policies, views on a particular issue or its official standpoint in stressful situations. She represents and advocates for the organization’s positions and carries out any other duties as assigned by the Chief Executive (Her Excellency).